Many of you will be aware of the efforts behind the scene of many of the volunteer organisations in the Nelson area to help mitigate the effects of the recent extremely serious, and still not fully out, fire. The Freemasons of the area were also at work as well. One of them Steve Webster (RHS) who is a volunteer fireman in Nelson spent many hours, with the rest of his watch, dealing with the back aching task of damping down the fire ravaged areas. 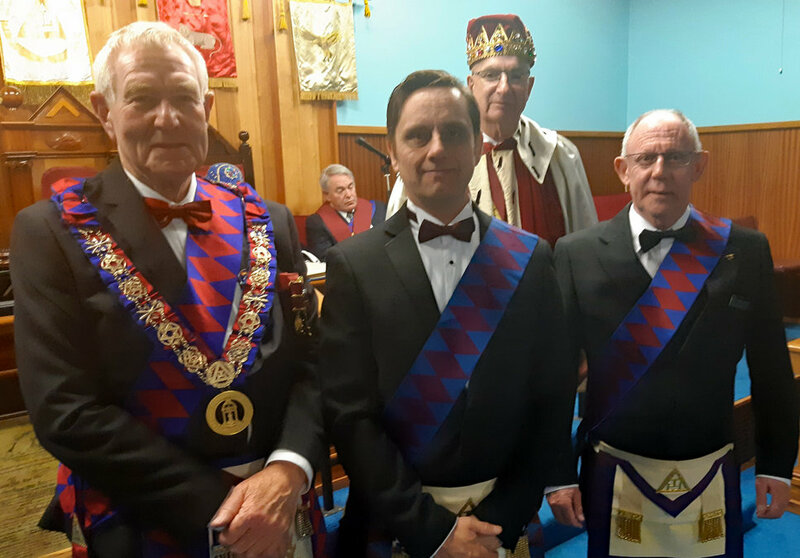 On the 23rd of February 2019 Marlborough Royal Arch Chapter held its annual installation. 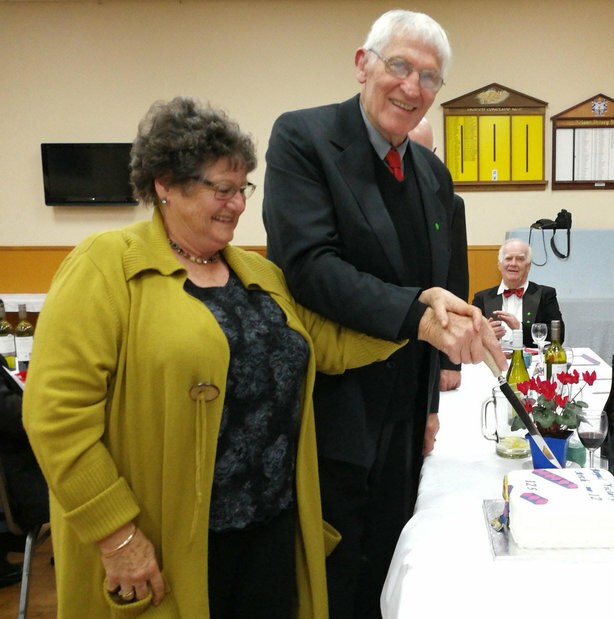 This year, due to the repair work being done at the Charles Street Lodge rooms, the event was hosted at the Havelock Lodge rooms in Brayshaw Park. This beautiful pocket sized Lodge room is a great place to hold such an event. The room also has a few interesting quirks including some unique acoustics. In that if you sit in the Master’s Chair the roof amplifies your voice so even talking in a whisper is clearly audible in the Senior Warden’s Chair. In addition (as I found out to my surprise.) if you sit at the Secretary’s desk and then deliver a charge it sounds like there is someone behind you talking as well. I looked twice as I gave the Address to the Companions charge to see if there was anyone there! Anyway it was a great occasion and the current and previous District Grand Superintendents assisted by V.E. Comp Russell Dickson and members of Grand Chapter did the incoming team proud. We wish V.E. Comp Ian Plummer another successful year in this chapter which last year had four new members and has two in the wings for this year. Busy times ahead for the new team. 16 Lodge Ladies from Nelson, Forrest, Victory/Wakatu and Southern Star attended the first ladies lunch of the year at the Lemongrass Café. The food was tasty and good value and we all had a good time. Several of the regular ladies were unable to attend and were missed! The next lunch will be on Saturday 30th March at the Chapel cafe and is already booked. Please book your place at the next lunch with Yvonne McLean. Lodge Waitohi tyled early on Thursday 24th Jan 2019 to conduct business and then head out to WBro Dale Webb and his wife’s lovely house for a Lodge BBQ. A great night was had by all and a few good yarn's told. Many Thanks to Dale and his wife for hosting this event and to the Lodge for providing meat and drinks and of course our wives and partners for the salads and desert!! The NDKA wish to thank you and your members who helped run our BBQ on show weekend, 26 & 27th Jan. It was a huge help to our Assn. which has a small committee running it, and the shows take a lot of organising, setting up and running. To have the Masons help us like you did was a huge help to us and so appreciated. We hope that you may be able to assist again next shows, end of January 2020. I have attached a few photos of some of the show winners, and our 3 International judges from India, China and Croatia. On Saturday and Sunday the 26th and 27th of January Masons from a number of the Nelson lodges assisted the local Kennel club who were holding their championship open day. ; The day was extremely hot the owners, and the guests and especially the dogs were HOT. Reports say that members of the Forest and the Nelson Lodge who helped became expert in the use of Bar B Ques and shed kilos in the exceptional weather we experienced. Is there a sausage for me? Who’s got the Ice blocks? The Marlborough Royal Arch Chapter meeting on 20th November 2018 was rather a special one. First of all this Chapter is having a resurgence of interest and has been carrying out a series of double and even triple ceremonies on new Companions. 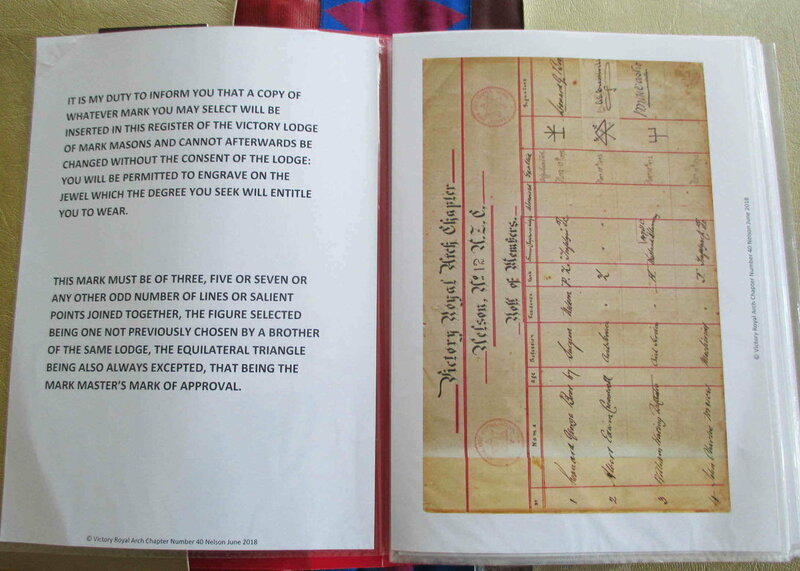 This follows on from the highly successful campaign carried out in the Marlborough area of the district earlier this year (which was spearheaded by a re-enactment by the Knights Templar of one of their ceremonies) with the aim of boosting the membership of Lodges in general and the Royal Arch Chapter. This evening two of the Brethren from the local Lodges completed what is the 6th degree in Freemasonry a Companion of the Royal Arch. 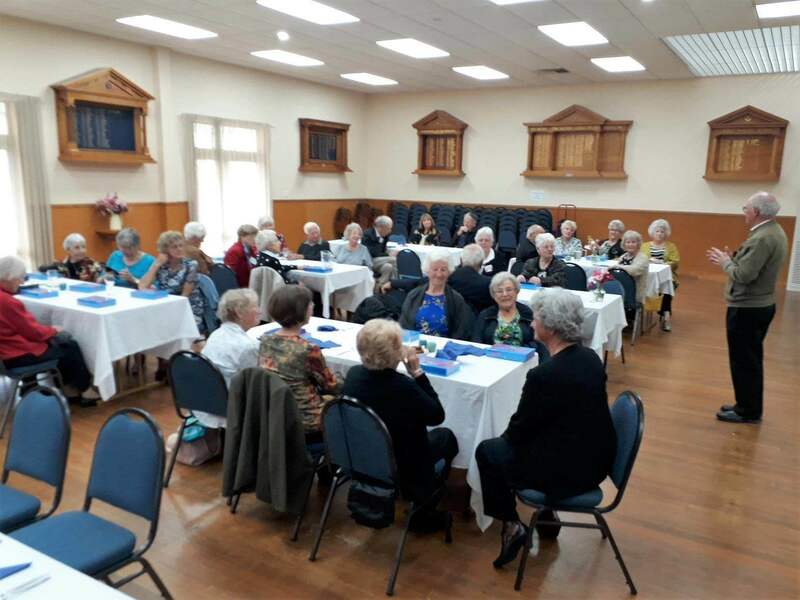 The ceremony was also attended by several senior members of the Victory Chapter from Nelson who regularly attend the Marlborough Chapter meetings. 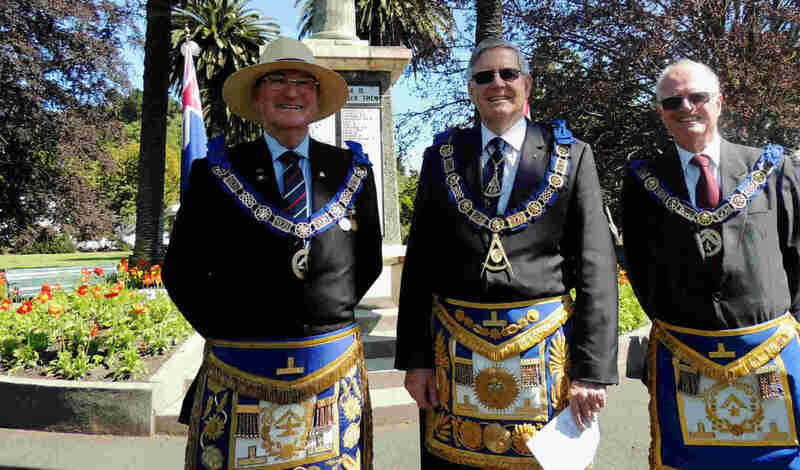 The ceremony was carried out by the 1st Principal, Ian Plummer, assisted by the District Grand Superintendent of the Royal Arch in Nelson/Marlborough/Westland Max Currie and the members of the Marlborough Chapter. (L - R Max Currie, Craig Hammond Ian Plummer (Z) and Vaughn Machon). On Sunday 2nd of December the Victory Chapter of Royal Arch Masons held its annual Pre Christmas social event at Founders Park. This event is a low stress event – well for the Scribe E as he doesn’t have to chase for names and numbers for this one! The event is a chance for the members of the Chapter and their significant others to get together in the gardens of the Founders Park to talk over the last year and their hopes for the year to come. The Founders cafe has just been refurbished with new owners and several of the members tried items from the new menu at this BRUNCH time event. The verdict – well done the new owners. The Principals of the Chapter would like to wish all their members and their families a very happy Christmas and safe and happy New Year. 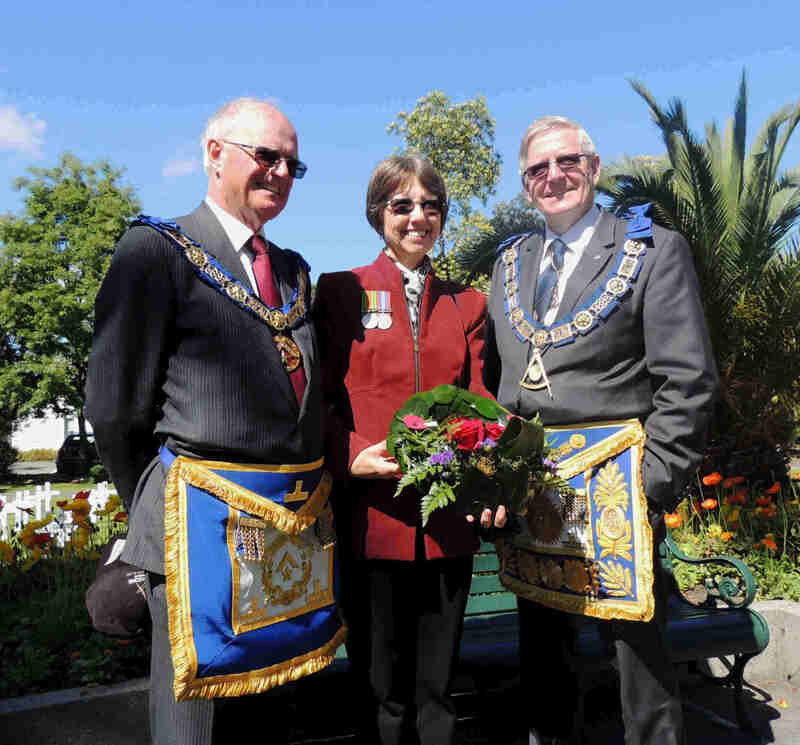 Nelson and Marlborough District Celebrate 118 years of Service. 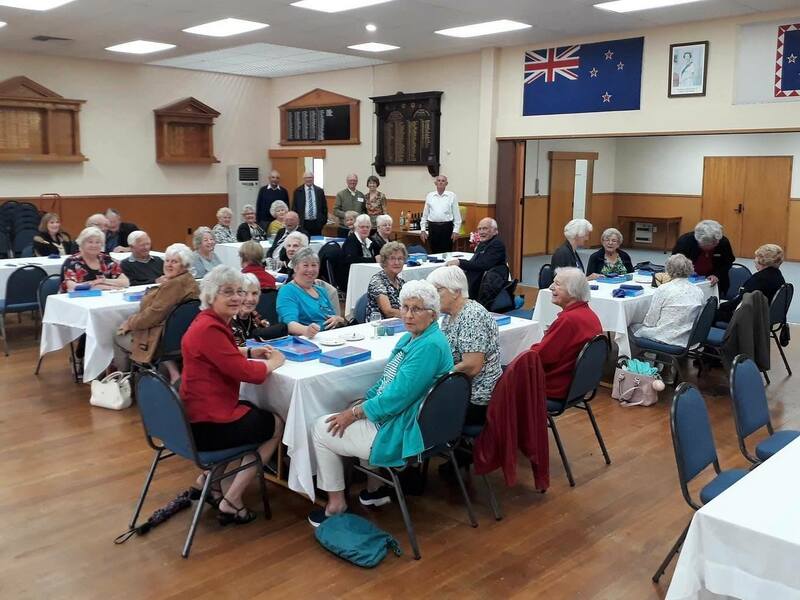 On 28th November 2018 a large number of the Nelson/Marlborough District gathered at the Masonic Hall in Motueka to celebrate the 118 years of service by the Motueka Bays Lodge to Freemasonry in general and to the local community in particular. The Masonic Hall (which in a previous reincarnation was part of a tobacco factory) has over those 118 years hosted many celebrations of the members of the local community and has also been used when the community needed to pay their last regrets to departed merit. 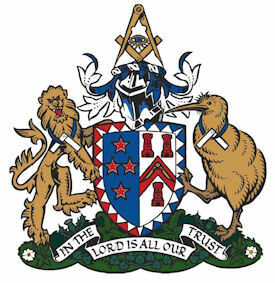 This evening was the last meeting of this celebrated Lodge as, like many small country town Lodges throughout New Zealand, it is no longer viable, both financially and membership wise. 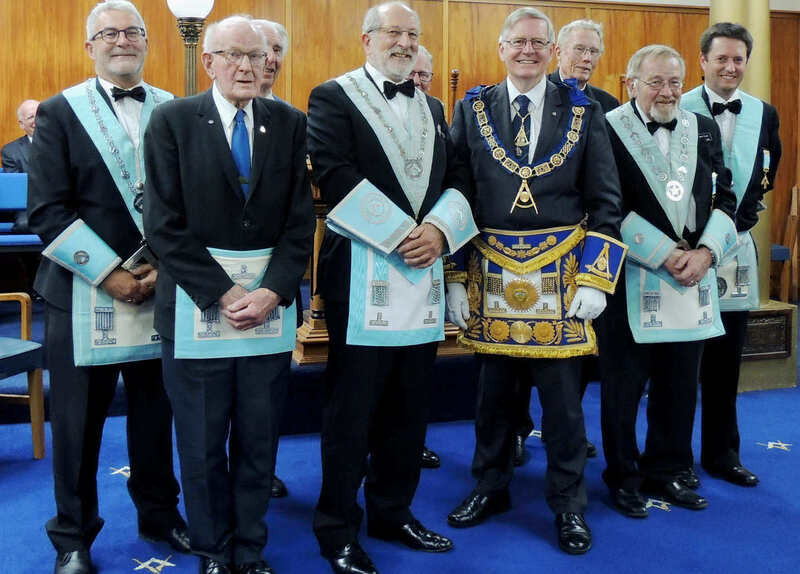 The final ceremony was overseen by the District Grand Master who spoke movingly of the many years of service the Lodge and its members have given to the community. On a positive note most of the remaining members of the Lodge have transferred to other Lodges in the area. 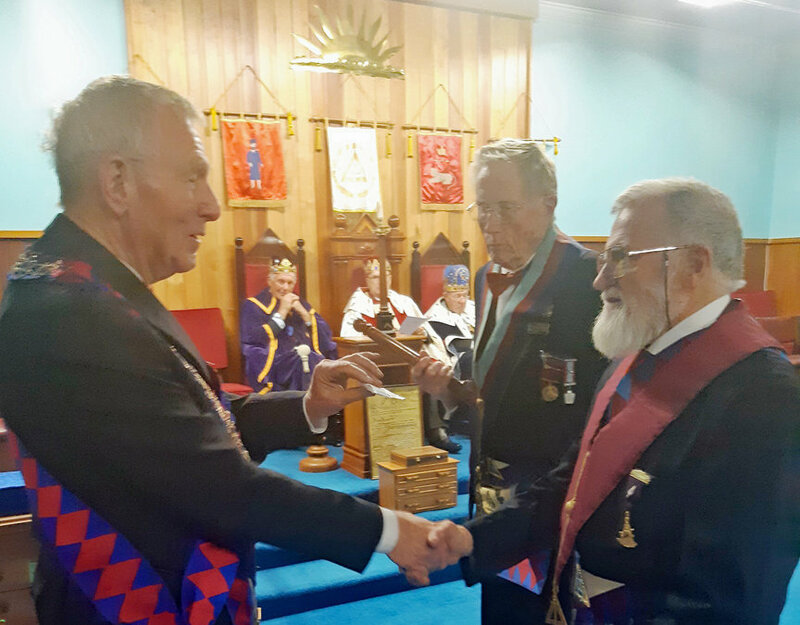 The District Grand Master then received the Lodge Charter on behalf of the Grand Master and accepted the collar and jewel of office of the Master of the Lodge. 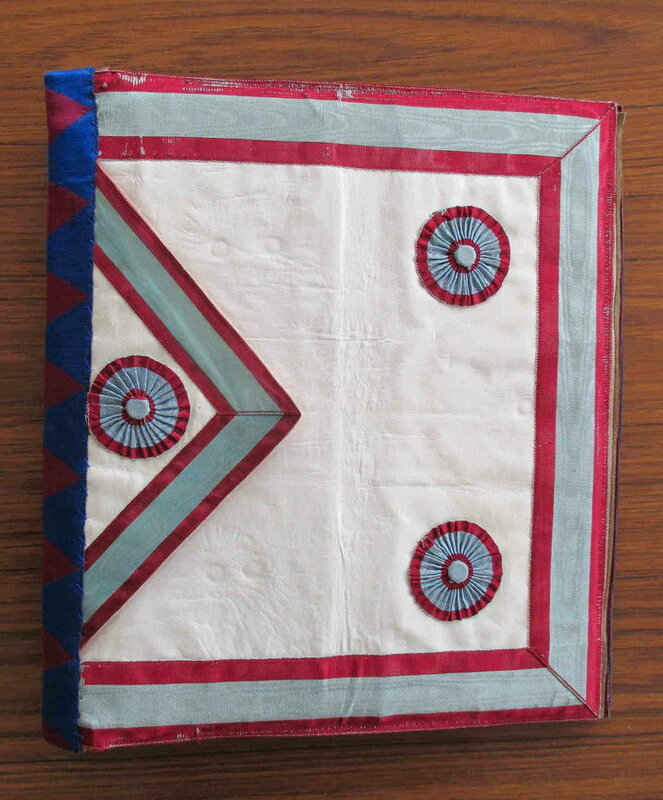 The photo shows the lodge room where the office bearer’s collars rest after being handed for the final time to the Master. For many years the Nelson Lodges have been organising and providing a pre Christmas lunch for the widows and senior members of local Lodges. This is just an example of how Freemasons look after those in our Masonic family. The regular point of contact for these important members of our family, are the Lodge Almoners, who keep in regular contact with the Widows. This annual lunch is supported by all the Lodges, and is attended by as many of the Worshipful Masters who can attend together with the Lodge Almoner. Each of the attendees gets a small gift to commemorate the occasion. Another major plank in this vital support infrastructure is the ladies lunches which are organised by the DGM wife Yvonne. If you want to get your own personal invite to these lunches please contact either Ian or Yvonne Mclean. 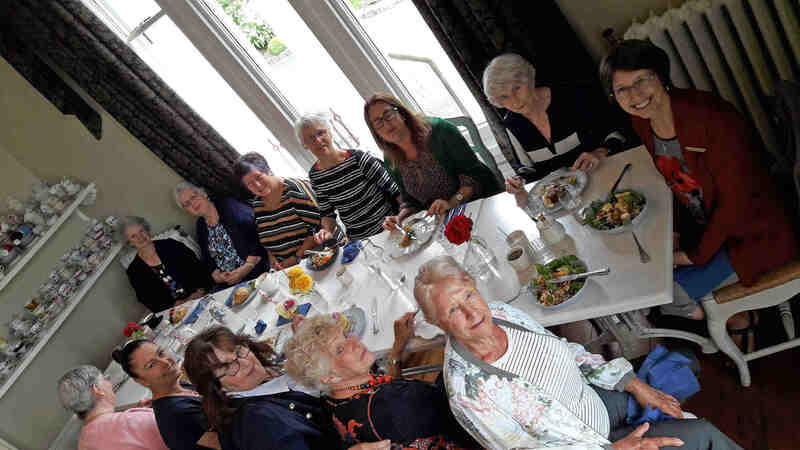 On the 17th of November the Masonic ladies of the District in Nelson met for one of their regular lunches at the beautiful venue of Melrose House. Some of the regulars were unable to come this time but it was lovely to be joined by several ladies from Southern Star; a lovely time was had by all. It was good to see that Jenny Smith is recovering from her broken wrist. The next lunch will be on 23rd February at the Lemon Grass in Richmond. Please book your place with Yvonne for this. Yvonne and Ian wish all the Masonic Ladies in the DistrIct a happy and non stressful Christmas. The weekend of the 10/11 of November 2018 marked a really special weekend for the Freemasons of the Nelson Marlborough District. Ian McLean managed to persuade Mark Winger, the Grand Master, to make a second visit to the District during his period in Office. 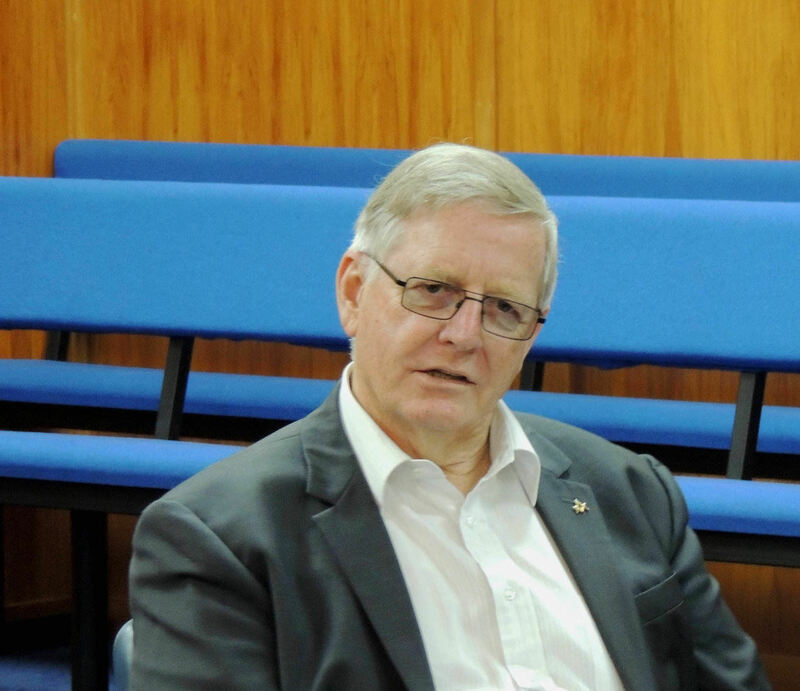 Ian has carried out a programme of events during his period of tenure so far to support Mark and his campaign to “Speak up for Freemasonry”, however this second visit within 12 months must be regarded as a mark of respect from the Grand Master for the District’s efforts. 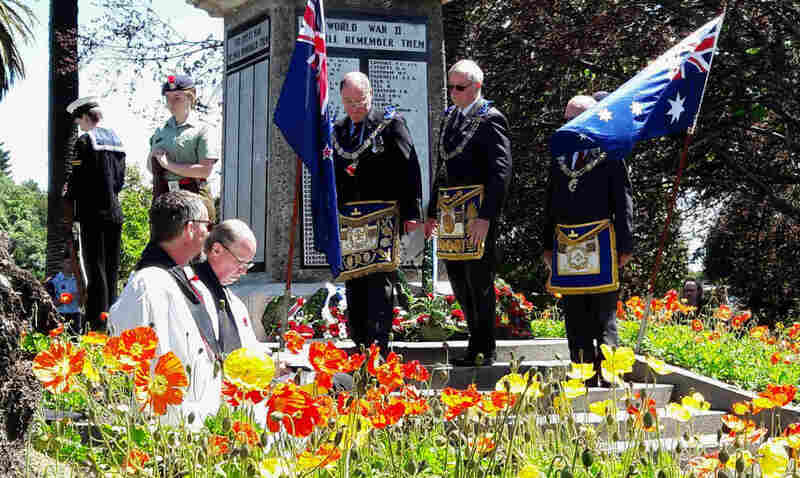 The Grand Master was invited to lead the Freemasonry Delegation at the service held by Nelson RSA to honour the 100 year anniversary of the Armistice. 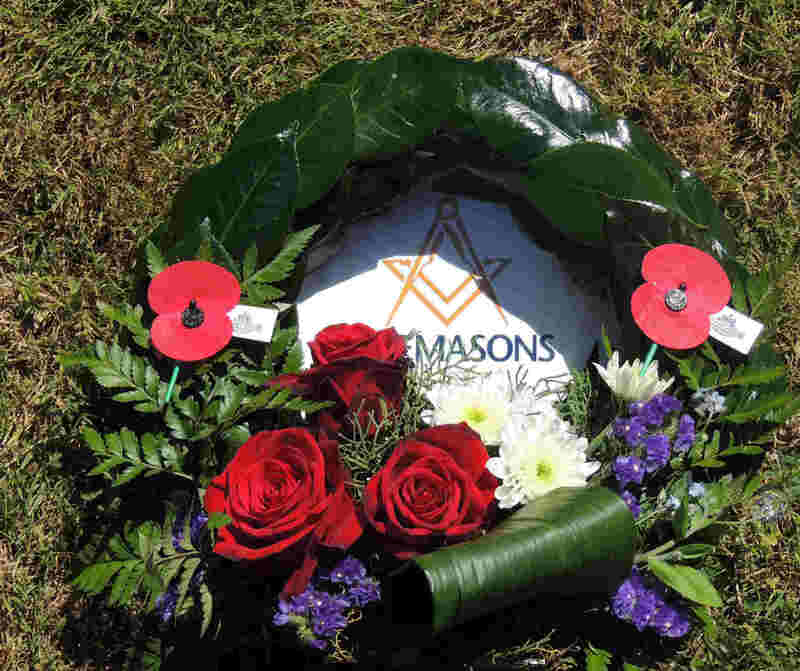 Ian Mclean had had long discussions with the local RSA and had been granted permission for a delegation of Freemasons to lay a wreath at the cenotaph. To mark how special that occasion was the Grand Master allowed all the Freemasons attending the cenotaph service and taking part in the following Parade through the town to wear Masonic Regalia. This is a major fillip to his Speak up for Freemasonry campaign in our District. The Divisional Grand Master Rob Angelo also attended and had provided valuable assistance to Ian in getting all the arrangements for this weekend in place. 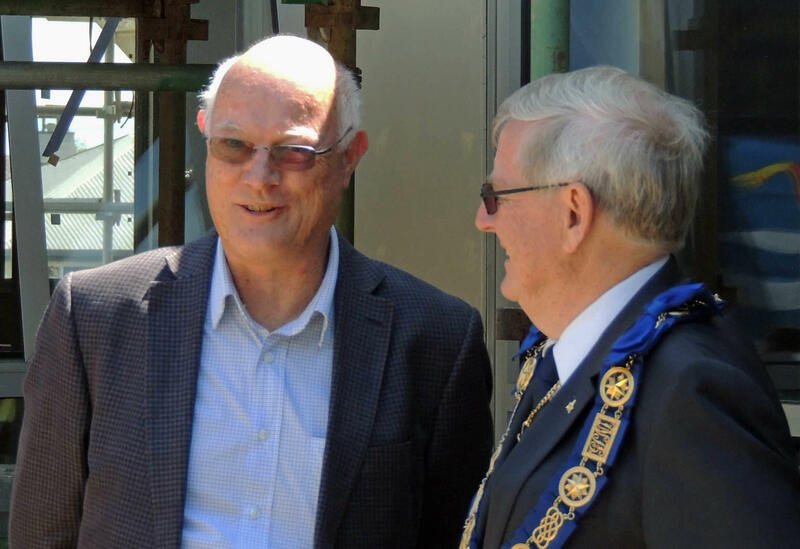 In addition to this public demonstration the Grand Master was also here to hand over to Nelson Tasman Hospice the major donation of over 60,100 dollars that Ian has organised and orchestrated for the District. 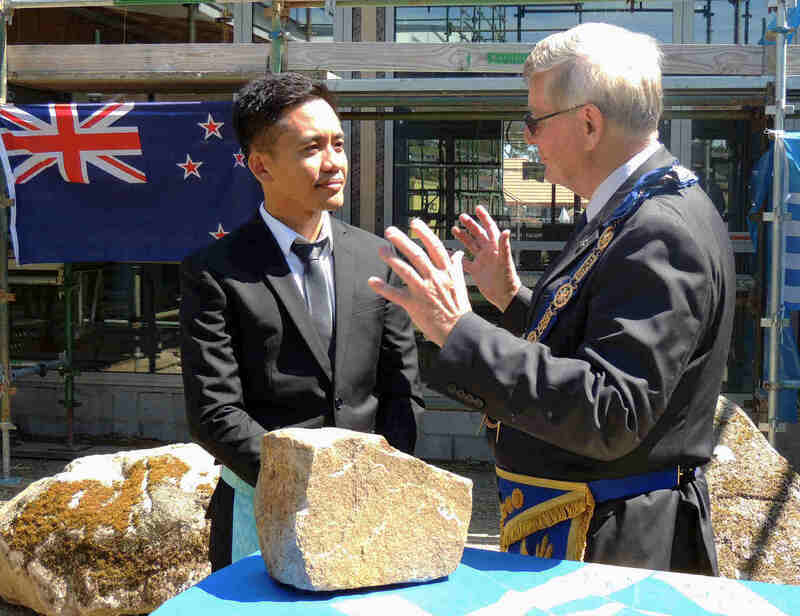 In photos are: Mark showing the Chairman of the Hospice Frans Delebeke, a rough and smooth Ashlar. 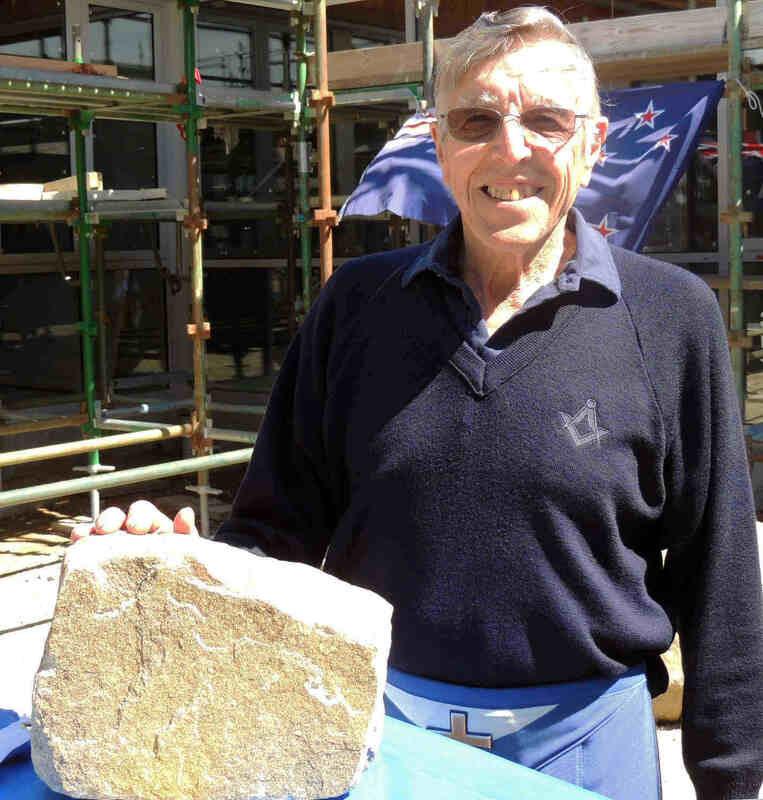 The rough Ashlar was from Antarctica and had been brought to Nelson in the early 1990’s and to this event by W Bro Iain Campbell. 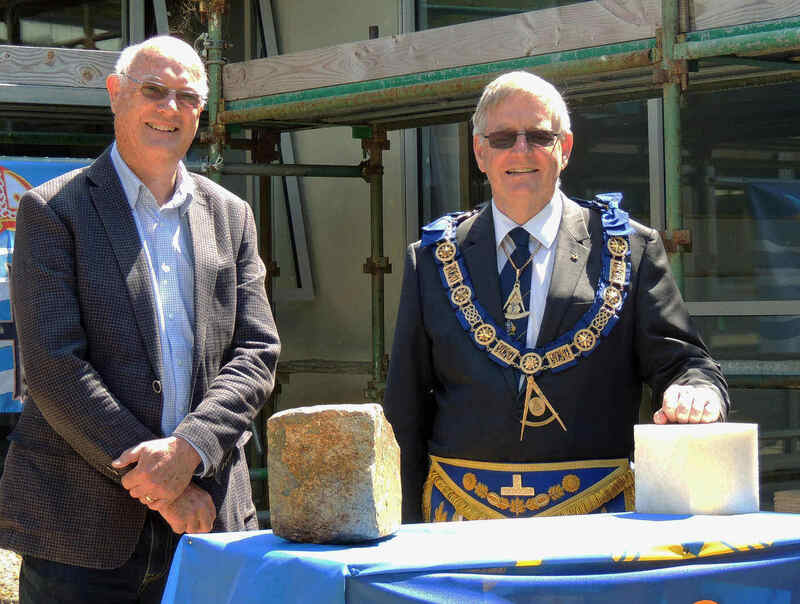 Mark spotted that one of attendees was a recently made Master Mason and took the opportunity to meet him and to explain the significance of the Ashlars to him personally. Mark’s relaxed air and friendliness permeated every part of this wonderful weekend. The final photo contains representatives from the whole Masonic community of the District who had contributed to the donation and attended this ceremony. These two major public demonstrations of our commitments to local society were supplemented by the Grand Master taking part in and leading, two Masonic events as well. 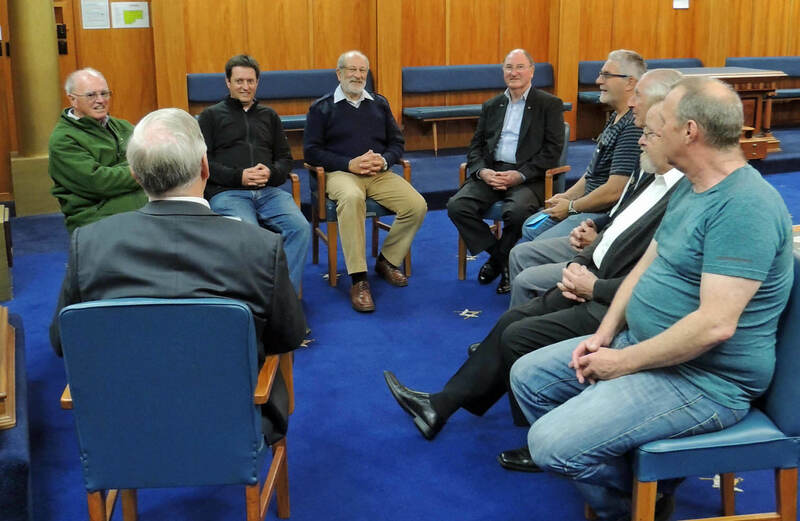 He hosted an informal meeting of the serving masters in the District where he went through with them how Grand Lodge is to continue the “Speak up Campaign”. 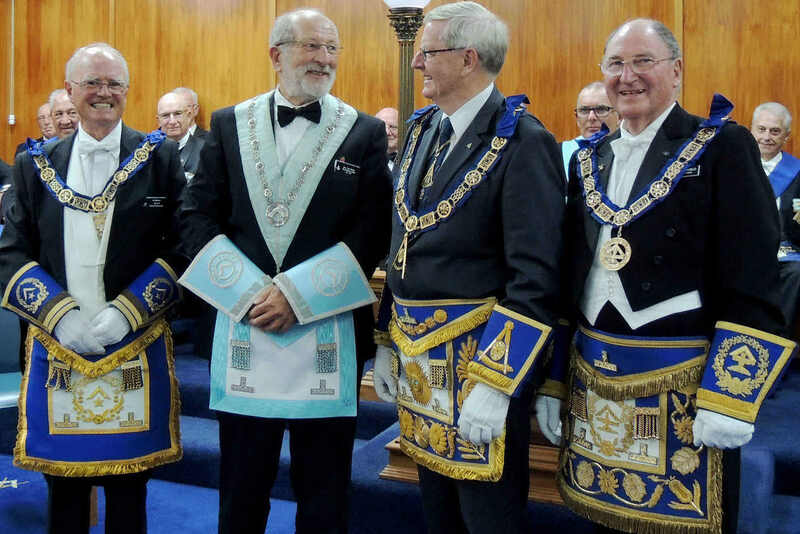 The Grand Master, together with a large contingent of Grand Lodge Officers and a number of serving masters, attended the installation of the new Master of The Forest Lodge. 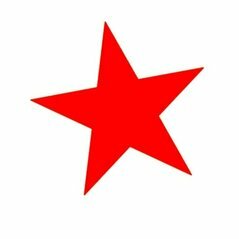 The Division and the District should give itself a huge pat on the back – the efforts of the Divisional and District Grand Master in making this weekend such a success has enabled us all to show just how we can add to the public’s awareness of what we as Freemasons can and have achieved for society in this area. by Wednesday 5 th December. 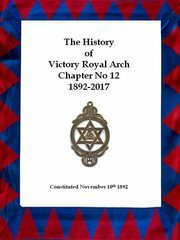 On Saturday 22nd of September Victory Chapter celebrated its 125 year of existence with a really special installation afternoon and evening. First the whole thing was done in the presence of the Grand Z Brian White and Grand J Dennis Gordon. This was a great honour for the chapter. V E Companion Barry Blundell was installed as First Principal ably supported by V Ex Comp John Connor (H) and Companion Gerit van Asch (J). In addition to an excellent and moving ceremony, the meeting also had three important special anniversary items. 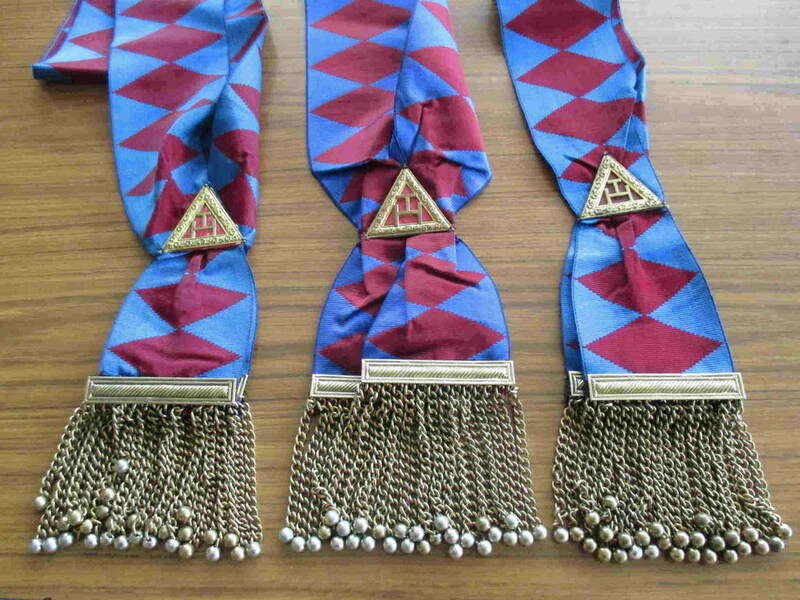 The first of which was the wearing of the recently refurbished Principals sashes. These very ornate and extremely heavy sashes had been abandoned for many years due to their rather sad and sorry condition. So to commemorate this special anniversary Russell Dickson and Ronnie Martin (partner of David Marsh) had totally refurbished these. These are so heavy that they will only be worn at nights of Installation. The second anniversary Item was the commissioning of the new Mark Register. This had been produced by the Chapters’ Scribe E who photo scanned of the old Mark register sheets and then photo shopped them so they were readable. These are now all safely held in a special binder. The finishing touch the new cover was again produced by Ronnie Martin using two old aprons that were destined for disposal. It was only when the cover was completed that a remarkable coincidence was discovered. Under the flap of the Mark apron was the stamp of the company who had supplied it – it was Chas R Martin of Melbourne Australia. The fact it was repurposed and reused by R(onnie) Martin was rather a spooky occurrence. The third and final anniversary item was the launch the book containing the official 125th History of the Chapter. This had taken many months of effort from the Scribe E and the Director of Ceremonies. The book starts with the founding of the chapter in 1892 with photographs of some of the earliest Principals and then, using extracts from the many minute books, brings the reader up to the present day. It also includes the biographies of several of the Chapter members who took part in the great and Second World War. This special section was researched by V Ex Companion Brodie Goodall. The meeting being over, the members and guest s (totalling 50+) went for dinner in the refectory where Russell Dickson and his wife were the Guests of Honour. Russell has just retired as Director of Ceremonies for the Chapter after being in that office for 33 years nonstop. Russell and Gill have done so much for the Chapter over the years it would take a week to list their contributions to the Chapter to make it the success it now is. Russell and Gill were asked to cut the special anniversary cake which they did and which was consumed with great gusto. All who attended that day went away having experienced some of the best Companionship I have ever seen. Well done Victory Chapter we look forward to the next anniversary in 25 years time. The content from this comments page is archived every few weeks to keep the listings at a practical length. Simply use the drop down below to review previous comments posted to this page.